As dragons go, this is a somewhat puny specimen; its tail is drooping and it suffers from scale rot. Can it still breathe fire? Only on the howled “IY-YI-YI-YI” hook, which I’d say was the only reason anyone bought this except it takes its own sweet time getting there. And once it’s past the energy level quickly drops again: “I Should Have Known Better” wants to be a big-striding alpha power ballad but doesn’t quite have the gumption, which perhaps explains its lack of afterlife. The rest of the song is sturdy, chest-beating guilt pop which never quite escapes the stocky shadow of Phil Collins. But while Collins at his ugly best captures the rage and frustration lurking behind male regret, Diamond is just a bit of a sad sack, appealing though his chewy Scots vowels are. You clap him sympathetically on the shoulders with one hand while sneakily checking your watch on the other. The video for this is sort of amazing, in that JD clearly WANTS you to believe it was from a film soundtrack. First in a string of five ballads in a row, this, so if Jim’s bluster doesn’t do it for you I’m sure something will. I remember this well, and still find it hard to believe that it got to number 1 – even then it seemed like a throwback to an earlier, less exciting age. You know what’s the most amazing thing about the video? When I first saw it, I thought that maybe the producer guy was looking forlornly at Jim Diamond because he was pining for the guy, and that this forbidden love was what broke up his family. And while I have a fondness for men with receding hairlines, that rat-tail is HIDEOUS. My 1984 reaction was disappointment at this getting to the top, Diamond breaking a seemingly endless line of memorable and significant-seeming songs. My main response was “MAKE THIS HORRIBLE NOISE STOP!” distaste at the earshredding effect of his voice, though. And still is, 25 years on. At least ‘I Won’t Let You Down’ was quite a good song before Diamond sang it, but I can’t imagine this sounding much cop sung by anybody. This was one of those number ones that snuck in during a gap in the big beasts’ release schedules. The song is quite strong; after all Jim had nothing else going for him. PhD were forgotten one-hit wonders and I bet most of the buyers didn’t realise it was the same guy. His follow up “We All Sleep Alone” (I recall RM’s cruel review “With a face like that it’s no wonder”) was predictably a resounding flop but he did manage another big hit with the Boon theme in 1986 and appears on two charity ensemble number ones to come. Jim was a guest on Johnny Walker (standing in for Jeremy Vine) recently doing the Tracks of My Years feature. I rather suspect Jim was standing in for someone too. Anyway there was a strange exchange where Johnny floated the idea that Jim had honourably stepped down from the top spot to make way for the historic behemoth that we all know is coming.Jim modestly replied that he was glad to do his bit. I thought hang on ! Are we supposed to believe Jim had a choice in the matter. And wasn’t there another record in between ? Flattering your (barely) famous guest is one thing; indulging his parallel universe is quite bizarre. I’d never heard of this one either, but then we’re entering the era of the ones I do remember being very much the exception. I’d never heard of Jim Diamond either, which is the first case in the whole of Popular including the early years where I’d never heard of the performer. There will be a lot more of those in the near future too. When I finally heard it, I really was disappointed. Not because he’d mangled an old favourite – I could have coped with that and given him kudos for trying – but because what I heard was a god-awful dirge! 3 from me. *I take the point about Strawberry Fields and Good Vibrations, but they were very much exceptional products of exceptional minds, unique jewels that would still shine brightly if they appeared today for the first time. IMHO of course. a dire poor-pitiful-me ballad that had me switching off the video pretty soon after the chorus came in. Next! I have no memory of this either, and having seen the video I can see why. The video finished only one minute ago and already I’ve pretty much forgotten it again. How did this get to number one? 5: “Little Suzi’s on the Up” by Ph.D.
New to me, and it’s hard to know what to make of it from that vid. (so no grade from me). Prima facie (audie? ), however, it’s amazing this got to #1 (maybe it was a record company stitch-up?). Am excited about what’s next. Let us pray. I’m going to buck the trend again and say that this isn’t as bad as I’d remembered, and that I could see it being even better sung by somebody else. I’m wondering what Whitney or Mariah could have done with it back in the day. (Not that the results would have been my cup of tea.) It could also work toned right down. Anything except that mid-’80s backing, really. None of which would bump it higher than 5 for me, and that would be generous. Four sounds right. Certainly the last #1 of the 80s that I’ve always had trouble remembering, assuming I ever did hear it – all I have is a memory from 11 years ago of a friend at college imitating the title as sung, deliberately badly. There’s four #1s from the late 90s I still struggle to recall anything about – all teen pop/pin-up/boy or girl bands. I remember every 00s #1 except maybe a few from 2007 onwards and maybe a few of the AA sides from before then. re #10 I know they bang on some pipes, but remain unsure of why the blue paint is necessary for this activity. In addition to being the last song that Tom doesn’t remember, it’s also the first in a surprisingly long stretch that the average American wouldn’t know about. Since the MTV era began, I think it’s worth pointing out, there’s actually been a lot of crossover between the American and English number ones. In fact, from 1984, this is the only completely unknown song, and only “Pipes of Peace,” “Two Tribes,” and the next number one wouldn’t be instantly recognizable 10 out of 10 Americans. re #14: the way people moan about early eighties NYC as a lost paradise for weirdness, you’d think Liquid Sky (1983) was cinéma vérité. I do remember this from the time (and “Hi Ho Silver”, the Boon theme that was also a hit. I don’t think I liked it much at the time, finding the IY-YI-YI bit quite grating. Listening it to again, it’s OK – I might stretch to a 5 or 6. There are many, many worse power ballads. #5 I think I read Bob Geldof saying that when Jim Diamond was on TotP performing this, he was asked by the presenter how it felt to be at number one, and he said something on the lines of, “it’s great, but next week, please could all the viewers not buy my record, but buy [the next number one but one].” Probably made no difference at all, but that might have been what Johnny Walker was referring to. Never charted in the U.S. And as someone who watched MTV, even VH1 a ton back then, I don’t remember seeing this on either U.S. channel. There’s a bit of Meat Loaf/Jim Steinman production in this. I can’t believe that Celine Dion has never covered this. Christ, it’s swings and roundabouts here sometimes isn’t it? Don’t think we’ve ever had such a plummet in quality between chart toppers. I’d forgotten it too which I now realize was an act of mercy on the part of my memory as it’s absolutely appalling. His voice does have a certain character but it’s one you want to punch in the face. is it me or does Diamond looks a bit like Travis frontman Fran Healy on the sleeve? 5# Correction to my earlier post.The follow up was called “I Sleep Alone At Night”. Along with Fern Kinney and Boris Gardiner this is surely the most unassuming number one of the eighties. I would stick up for Jim. I barely remember 1984 so I can’t feel directly nostalgic, but several of the previous chart-topper from that Orwellian year seem like sound and fury signifying hairspay. A big year perhaps, but a vintage one???? There seems to be heartfelt quality to this track which is lacking from some of the blockbusters. I always really liked Hi Ho Silver too. I hated this. As Nick P mentioned at 2, even at the time it seemed like some kind of 70s throwback. It might have had heavy Radio 2 play, but I can’t remember exactly. Jim Diamond is a great name for a pop star though, isn’t it? Such a pity he had to be short, balding and whiny voiced. The gag going around Our Price, Epsom, was that this was about a cheese called Chounonbert, probably the French equivalent of Lymeswold. Did anyone else find this amusing at the time? That “ay-yi-yi-yi-yi-yi”; the sheer datedness of the production (it sounds like a Pilot demo); the sneered, self-mocking “hyyeah I shoulda known better” on the second line of each chorus; and best of all, the proto-Duffman “Ooohh yeah!” just before the last batch of “ay-yi-yi”s. Lyrically, it covers the same ground as I Won’t Let You Down (again) and I wonder if Jim’s singing to the same cuckoldette, who has finally got sick of his philandering ways. Sonically, it was such an unlikely ’84 chart topper, and I have to applaud Jim’s bravado – he approaches the song as if he’s singing a future standard. Like Tom at 20 I’m amazed it hasn’t been covered by a US femme belter or a balding welder on X Factor. I never hated it and listening it to it now I know why. The Tizer bubbles-up-yer-nose fizziness of the year is entirely absent; I agree with Anto at 24 that ISHKB has more direct emotion (whether overwrought or not is beside the point) than pretty much any Popular entry from ’84. Jim probably didn’t intend it to be funny exactly, but that also gets it bonus points from me. Sometimes I think I like music for different reasons to most people. Still, even I can’t go beyond a 6. I remember this, did Diamond do the theme to Auf Weidersein Pet too? I a bit of a stinky ballad that I briefly had a soft spot for, but I cannot really get behind a song which advocates not lying to someone just because they are beautiful. Good call for Liquid Sky above #18, I just saw that for the first time, it was my friends answer for worst date movie ever and its a strange MTV meets lots and lots of drugs eighties classic. You could make a call for Wild Style as an early 80’s kitchen sink hip-hop movie, but that pushes us away from the bouffant aesthetic that Mark seems keen on. re 27: that’ll be Joe Fagin who sang That’s Living Alright, theme from Auf Wiedersehn Pet, later covered by Earl Brutus. Thinking of Boon, I remember a (Time Out?) article where someone noticed a “professional Michael Elphick lookalike” in the small ads of The Stage and interviewed him to see what kind of response he’d got. Not much, was the answer, apart from the reply from said interviewer. He had been working as a professional Bob Hoskins lookalike, but the work had dried up. Poignant but hilarious at the same time, rather like Jim Diamond’s hit. Except of course for the “in Space” bit of the title which is also how it suckered me in when it was shown on Moviedrome. I think I may have also had a brief bit of confusion beween Jim Diamond and Jim Davidson, who certainly should have known better for his entire career. Will at 25: I’m unsure about Radio 2 play but this defintely had heavy Radio 1 play at the time as it reminds me of an office where I was a messenger at the time and the girls in there used to have Radio London in the morning and Radio 1 in the afternoon (Steve Wright etc). As I remember it of the number 1’s from the period 1979-early 1990s (I dont really know about the period afterwards)I’d say only Lena Martell and probably Dr Hook, Barbra Streisand and Art Garfunkel were played significantly more on Radio 2 than Radio1. Wow. Never heard of this one until today, and now I’m sorry I clicked on the video link. There’s a real rancidity to the thing: “I should’ve known better with a girl as beautiful as you” because a homelier girl would’ve been easier to cheat on? A 2 at best. I don’t doubt that this got heavy play on Radio 1 as it’s earnest, singer-songwritery quality would have been right up the street of most of their DJs who seemed uncomfortable with the new fangled 80s pop – apart from that Phil Collins chap, that was proper music! – and wished they could play Gerry Rafferty and Harry Chapin all day. I distinctly remember Steve Wright doing an awful limp-wristed and fey impersonation of Marc Almond whenever he played ‘Say Hello Wave Goodbye’ and just cringing. It was like the charts were Alexie Sayle and he was still Jim Davidson. 35# I get your point (and I hate Steve Wright too) but should point out that Sayle is actually older than Davidson. On the ‘beautiful as you’ line, I’d cut Jim some slack – we all tend to see our partners as beautiful/handsome, particularly in the early stages of a relationship. I don’t think he’s really claiming that only supermodels deserve fidelity. 1 November 1984. Also in the studio that week were; Heaven 17, Duran Duran and Wham! Mike Smith and Gary Davies were the hosts. 15 November 1984. Also in the studio that week were; Matt Bianco, Slade, Alvin Stardust and Nik Kershaw. Mike Read and Bruno Brooks were the hosts. 29 November 1984. Also in the studio that week were; Nik Kershaw, Kool & The Gang, Alvin Stardust and Black Lace. Peter Powell and Janice Long were the hosts. I remember the bit where Jim Diamond thanked record-buyers for making him number one but then urged them to go and buy (what turned out to be) the next chart-topper but one instead. As I recall it was in a radio interview rather than on TOTP, but no doubt he was saying that to quite a few people at the time. As for having a choice in the matter, Mike at #5, no doubt that “glad to do my bit” was a gag. He came across as a thoroughly nice bloke, which makes it all the more a pity that his record is drivel – whiney, dull, and the I-YI-YI-YI bit which is presumably supposed to convey emotion thoroughly unconvincing. His previous hit with PhD was far more palatable. ah, mr diamond [not that one] with his hits “i should have known better” [not that one] and “hi ho silver” [not that one]. surely the first pop star to have a career based entirely on administrative error. i’m with the majority in never having heard (of) this, but i always quite liked “hi ho silver” (“you cockney lone ranger”) as a very low rent take on “rhinestone cowboy”. is ‘gregory’s girl’ 80s kitchen sink? probably too early for highlights, but there are certainly perms. ooh GOOD call re gregory’s girl! (1981, feat.claire grogan’s atrocious acting) — don’t recall any schoolkids in it sporting would-be new-romantic or 80s glam modes, but it certainly belongs in this territory: however like most of forsyth’s work it has a kind of militant anti-dowdiness: ordinary life is not so awful! I think Letter to Brezhnev is unsurpassable in the kitchen sink romo stakes. Karen Grant is responsible for me deciding to leave school aged 16! Its the Hi Ho Silver (theme to Boon) I am getting confused with That’s Livin’ Alright and the inestimable Joe Fagin. All the Grants – Bobby, Sheila, Damon, Karen – were avatars of one sort or another. I think I used to fancy Karen a little, she had that clever working class girl sass about her. Oh yes, the black sheep of the family. which I was always very impressed by. Unlike the record. Oh dear – Mr Diamond – an erstwhile good bloke and no doubt a bit of a muso trooper kind still manages to make a dogs breakfast of this. A voice like nails down a blackboard with additional vocal ticks doesn’t make for good power – ballad material. Having said that I pretty much hate the power ballad genre so it was never gonna be a fav of mine. With the exception of a couple of decent no1s I certainly don’t see 1984 as being the mighty year everyone else seems to think it is. Admittedly though my music radar tended toward the whole chart (and beyond) rather than just the number ones and I judged each years ‘worth’ accordingly. Some very good stuff around in 1984 – just not necessarily at the top. In the most part a totally forgettable song but it is responsible for the origination of the phrase “Jim Diamond Vein” round my neck of the woods. On one of his TOTP appearances Jim’s emotionally wrought performance went into overdrive on the “Ay Ay Ay Ay” bit and a large protruding vein started bulging on his forehead. It was like an extra limb and was the talk of our school the next day. Henceforth, anytime anyone suffered same said protrusion the cry “Look at his Jim Diamond Vein!” could be reasonably expected to be yelled ad nauseum. Fast forward 20+ years and one of the “Jim Diamond Vein” crew was DJ’ing in a bar in Leeds. The owner introduced him to a new DJ called Lawrence, a mere slip of a lad. Being a DJ groupie as I was in those days we soon got chatting away and over the course of the night he let slip that he got a lot of his record collection from his Dad who was a musician. “Oh”, I asked innocently “anyone I’d have heard of?” “Maybe” said Lawrence “Jim Diamond, he had a couple of hits, he even had a number 1”. “You mean Jim Diamond, I Should Have Known Better, Hi Ho Silver, PHD, I Won’t Let You Down, The Jim Diamond Vein!?!?!?!?!?!? !” I blurted unable to contain my disbelief. “Erm, yeah” said Lawrence, looking a touch worried. Naturally I filled him in on the JDV phenomenon and made him promise that he’d tell his Dad all about it. I don’t know if he ever did. Not to long after that, in an entirely unrelated series of events, Lawrence moved to London to seek his fortune. I still wonder if somewhere, in some town, on some stage Jim doesn’t get to the “Ay Ay Ay Ay” bit and think about how prominent his vein looks. Seemed a decent enough bloke although not exactly the kind of thing I was rushing out to buy back then and it might just be me but theres a certain something in the delivery which reminds me of the pompous, overwrought nonsense peddled by David Gray. One of who’s worst crimes was the stripping away from ‘Say Hello Wave Goodbye’ of every molecule of anything that made the original so good in an effort to turn it into some awful, po-faced, American music business pleasing acoustic rock ballad (qv ‘Mad World’ by some bunny embargoed person who I couldnt remember the name of even if I was allowed to). This was one of those songs that provoked an automatic UGH of bored disdain, whenever it forced its presence upon me. It’s also the first Number One since “Coward Of The County” which refused to cue itself up in my mental jukebox; until I found it on Spotify, I couldn’t recall a single note. Unfortunately, and even though I’ve only played it the once, it has now restored itself in my memory in full grisly detail, and has duly been one of this week’s most unshakeable earworms. So, er, thanks a bunch for that. It’s at times like these that I question the value of this project! This is tremendous sample bait – great, sonically novel hook surrounded by dross that nobody has ever heard. Dibs!! PhD’s “I Won’t Let You Down” was one of the great one-off hits of 1982, a Jon and Vangelis derivé which manages to become something more, especially in its hosanna of a final section when Tony Hymas’ cathedral organ and Jim Diamond’s pinched contralto turn it into a New Pop hymn, just the other side of yellow from the Teardrop Explodes’ “Tiny Children” and the two prog rock/pub rock veterans succeed in exceeding themselves. Hymas proceeded to a curious career which involved both extensive session work and some toe-dipping in the world of improv – playing and recording with, inter alia, Lol Coxhill, Steve Beresford and Tony Coe – while Diamond, a stockily cropped Glaswegian with an alarming resemblance to Jimmy Somerville’s unfunny uncle, returned as a solo artist, managing to squeeze himself into the top slot for just one week in between the heavier hitters. “I Should Have Known Better,” co-written by Diamond and Graham Lyle, and nothing to do with either the Beatles or Wire, is a far more conservative proposition than “I Won’t Let You Down,” a fairly straight would-be power ballad – a Cumbernauld “Careless Whisper” – which with its pre-Knopfler guitar solos seems to belong in 1974. 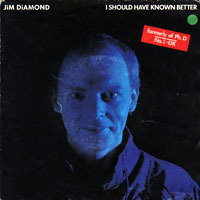 Although there are some interesting touches – the regretful, shoulder-shrugging three-step semitone descent after Diamond’s “I know that you saw me…you turned away,” his rueful “yeah!” in the third line of the first verse – the dominant strains are Diamond’s yodel of “Ay-ay-ay-ay-ay,” which unintentionally echoes in part the next number one, and his rather less attractive vocal stridency, a patch of grass somewhere between Freddie Mercury and Kevin Rowland on which you wouldn’t wish to sit for more than four minutes, not to mention the completely out-of-place phlegmatic “ooh yeah!” just before his final assault. After PhD, it’s a bit of a letdown. Scanning around on the music channels tonight, I saw that Summer Hits TV (whatever that is/whoever they’re affiliated to) is playing the #1s of the eighties, so I switched on and was greeted by this. I’d never heard it before, so of course I came here and found general amnesia was the view here too. Its not very good, so nondescript I can well imagine that people forgot it quickly. It finished 15 mins ago and I can’t remember anything about it. Rather than Fran Healy, I think the sleeve looks like Sheldon from The Big Bang Theory. @58 etc: I think the sleeve pic makes him look a bit like his fellow Glaswegian, Midge Ure. Always preferred I Won’t Let You Down, but this was fun.